The EVO bar is Pro Taper’s top of the line bar with no crossbar. Oversize diameter handlebars, without cross bars, were invented, and patented, by Pro Taper. This design allows the bar to flex more and absorb impacts better than other bars. This offers the rider more comfort and no more fatigue without sacrificing bar strength. 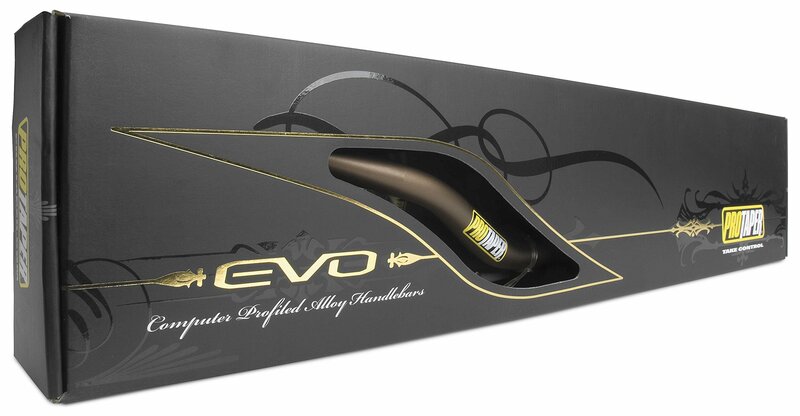 The EVO handlebar utilizes a pc profiled 4mm wall design and is up to 25% lighter than other bars yet up to 45% stronger. Motocross Action magazine says of the EVO bar: “The amount of flex Pro Tapers provide takes the jolting edge off of rough tracks and lessens hand fatigue.” and Transworld Motocross magazine says: “We do not care what sort of bike you ride, the EVO will beef up the comfort.”.